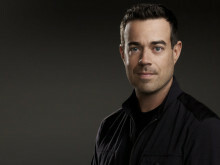 Carson Daly is a pioneer of pop culture across a multitude of media, including network television, radio, the recording industry and digital. He currently hosts “The Voice” on NBC, the network’s exciting vocal competition show, which premiered as the number one show on its night in primetime television and continues to grow as NBC’s highest-rated primetime show in the past five years. Daly’s long-running late night NBC show, “Last Call with Carson Daly,” is currently celebrating its 12th season to record ratings. In addition, Daly continues to host his top-rated morning drive radio program on 97.1 AMP FM Los Angeles. Daly began his career in radio in the early 1990s, quickly moving up the ranks as an on-air deejay in five different cities within his first five years. Shortly thereafter, he landed one of the most coveted positions in the business — that of the early evening voice of Los Angeles’ influential and top-rated KROQ-FM. MTV soon recognized his talent and brought him to New York City. It was at MTV that Daly became distinguished for his roles as gracious host and trendsetter, and ultimately planted the seed to become the entertainment icon that he is today. His popularity exploded in the era of ‘N Sync, Britney Spears and Eminem, as part of the show that changed the landscape of music and television. As host and executive producer of MTV’s “Total Request Live” (TRL), he transformed an afternoon music video program into a must-stop on the publicity circuit for musicians, movie stars and entertainers alike. It was Daly’s guy-next-door charm that made him so appealing, and more so trustworthy, as he entered living rooms daily to offer exactly what the audience desired. His reputation as pop culture tastemaker was cemented. In January 2002, his loyal fans followed him to NBC and tuned into his late-night television show “Last Call with Carson Daly.” Re-writing the rulebook for late night television, Daly has taken his show out of the studio and on location every night. The strategically curated bookings extend to a wide array of great storytellers, inspired by Daly’s adoration for the acclaimed “This American Life” program. While the show boasts diverse bookings in the worlds of entertainment, politics and sports, it is the progressive music bookings that have earned Daly his bragging rights among the late night crowd. Since day one, “Last Call” has been the show that gives many of the hottest bands their first break on U.S. television including The Killers, Maroon 5, Ray LaMontagne, Modest Mouse, 30 Seconds to Mars, B.o.B and many more. Daly and Universal Media Studios produce the annual New Year’s Eve primetime special “NBC’s New Year’s Eve with Carson Daly” as they ring in the new year live from Times Square. As executive producer, Daly has led the broadcast on all NBC platforms — both on and offline. Past musical performances have included Rihanna, Jay-Z, Green Day, Sir Elton John, Alicia Keys, Katy Perry, Ludacris, Mary J Blige, Avril Lavigne, Panic! At The Disco, The Ting Tings and Lenny Kravitz. In January 2010, Daly returned to his radio roots and currently hosts morning drive from 6 a.m. until 10 a.m. Monday-Friday on KAMP (97.1) in Southern California. Do you want to hire Carson Daly? Directly request a quote. In 48 hours we can send you the availability of Carson Daly If you would like to book Carson Daly, Entertainment Booking Agency is the right place. We will offer you the best price and contact the management or we directly contact Carson Daly. For corporate appearances or speaking engagements you can contact our agents and the will help you true the process. Tags: hire Carson Daly, Carson Daly booking, book Carson Daly, Carson Daly appearances, find more information on booking Carson Daly for appearances, Carson Daly speaking engagements, Carson Daly endorsements/spokesperson, Carson Daly appearance fees, Carson Daly booking agency contact info, biography of Carson Daly, Contact an artist booking talent agent find a speakers bureau that can book Carson Daly, speaker booking agency for Carson Daly, Carson Daly booking agency, Carson Daly booking for corporate event. EBA is one of the biggest entertainment booking agencies in the World. We book hundreds of celebrities, artist, athletes and speakers in a year. Important to know is that we are not claiming to be the management of Carson Daly. We are not the official agent for Carson Daly. Companies from around the globe book these artists and speakers true our company be course we have one of the biggest networks and we always have direct contact with the artist or the management. We help you to find the right celebrities for your corporate of private events. Please contact one of our agents to get free advice and we will help to get the world-famous artist on your party.